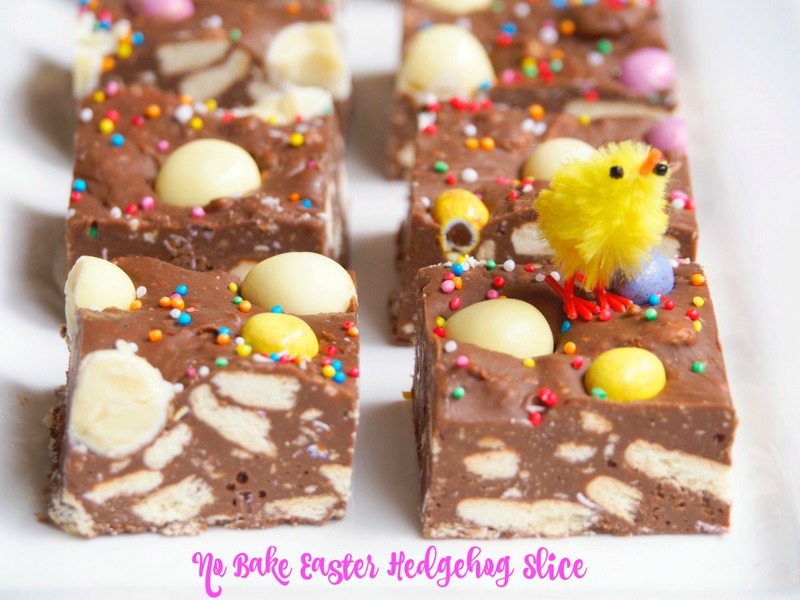 This chocolate no bake Easter slice is a delicious variation on the classic Hedgehog recipe. It’s egg-stra special! 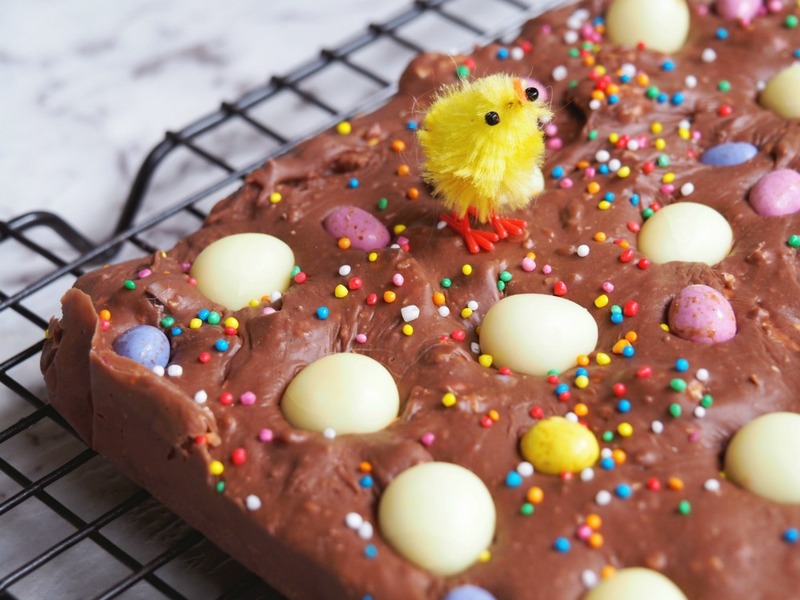 Now it’s April, can we please start talking Easter recipes because I am egg-stremely egg-cited! Because I had that extended kitchen sabbatical being overseas, I was a bit late to my own Easter recipe planning party but at least I rocked up with a lorry load of Easter egg goodness from the motherland. To be honest, I could have easily filled a whole suitcase with British confectionery, especially of the Easter variety but there is such a thing as luggage allowances. Boo! I did however make a valiant attempt at filling a whole (and very large) packing cube with all things sweet and among them were these Milky Bar eggs and micro eggs. I’ve never seen the Milky Bar eggs down under and with the crunchy white shells and milky white chocolate inside, it was love at first bite. I wanted to make something that was simple, delicious and would show those milky white eggs off to their best advantage. I’m a huge fan of Hedgehog Slice and as well as the classic, I also have a Christmas version so it seemed only fitting that I add an Easter slice to my Hedgehoggy collection. This recipe is pretty forgiving, you can use all dark chocolate if you like but I find the combo of milk and dark really hits that sweet spot. And don’t stress if you can’t find Milky Bar or micro eggs, just use your favourite mini eggs and every bunny will love it all the same. I went back to the office after my extended break and my colleagues were clearly treat starved because this slice attracted teachers to the staff room like bees to a honey pot! Every bunny went wild for this one and it was such a huge hit. I left the slice on the bench all day, just so everyone would know it was there and the slice tasted as good as ever, maybe, dare I say, even better as the chocolate had softened and was all fudgy and delicious. But eating it straight from the fridge is still my personal favourite! What’s your favourite chocolate – dark, milk or white? What’s your favourite Easter treat? Combine condensed milk and chocolate in small saucepan and stir over low heat until smooth. 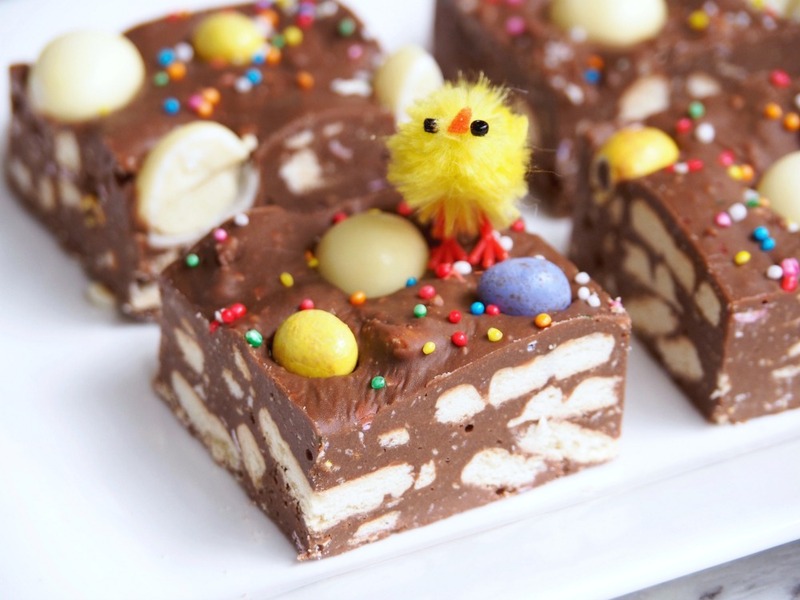 Place biscuit pieces in large bowl with most of the Milky Bar eggs and micro (or mini) eggs, add chocolate mixture and stir to combine. 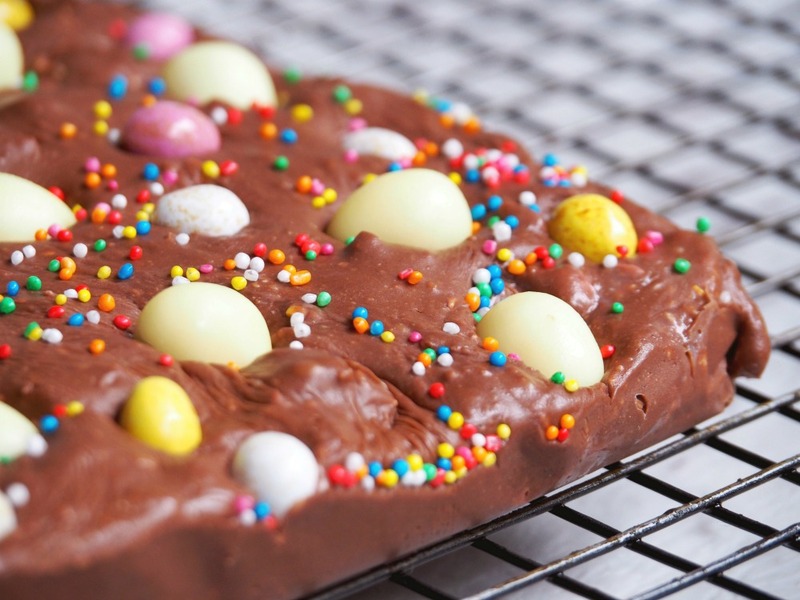 Spread mixture into pan, shake over some sprinkles and decorate with remaining Milky Bar eggs and remaining micro eggs. Refrigerate about 4 hours or until firm. Remove from pan and cut into slices. Grease 8cm x 26cm (3 ¼ inch x 10 inch) bar cake pan; line base and sides with baking paper, extending paper 5cm (2 inches) above long sides. 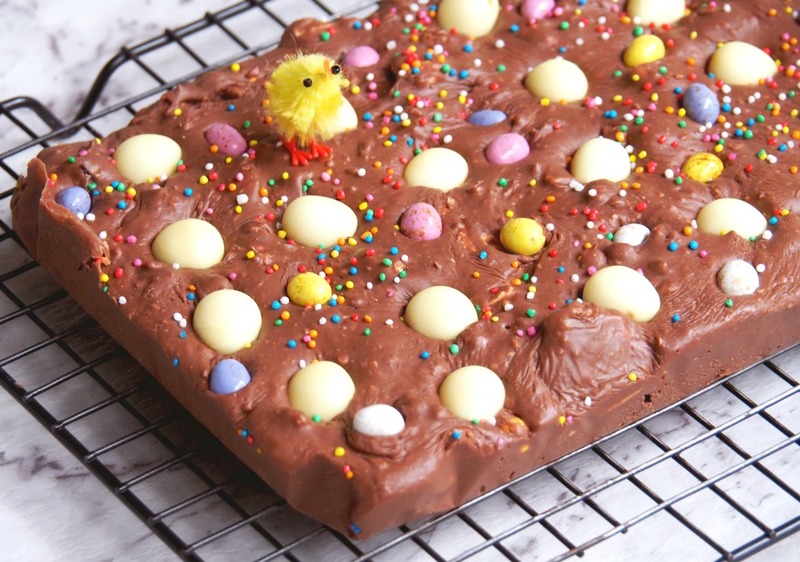 Add biscuit pieces, most of the Milky Bar and micro eggs and combine for 20 seconds on reverse speed 3 using the spatula to assist.